Posted on December 22, 2017 by Sara K.
[When using life-alienating communication] Our attention is focused on classifying, analyzing, and determining levels of wrongness rather than on what we and others are needing and not getting. This is a screenshot from this scene in the 1995 TV adaptation. Xiaolongnü: How are you still calling me ‘auntie’? Does that mean you weren’t sincere in the way you treated me? Who do you think I am? Yang Guo: You are my teacher, you love me, you teach me, I’ve taken a vow, I will respect you for the rest of my life, and obey you. Xiaolongnü: Does that mean you do not consider me to be your wife? Yang Guo: No, no! You can’t be my wife, how could I be worthy? You are my teacher, my auntie. Xiaolongnü: If that’s how it is, never see me again. One can see how the actors performed this scene in the 2006 adaptation here, the 1983 TV adaptation here, and in the English dub of the anime adaptation here (note: if one chooses to watch the full episode rather than just this specific scene, be aware that this episode contains a sexual assault scene). So, are there any of the D’s of Disconnection in there? 1. Diagnosis, judgement, analysis, criticism, comparison: Xiaolongnü judges Yang Guo for possibly not being sincere. Yang Guo also compares himself to the ideal of who he imagines may be worthy of marrying Xiaolongnü, and judges that he himself is not worthy. 2. Denial of responsibility: Yang Guo does not say ‘I do not want to be your husband’ or ‘I choose not to be your husband’ instead he just says its not possible. Thus he is denying his responsibility for his choice not to marry Xiaolongnü (for the record, I think it is always okay for someone to choose not to marry anyone they do not want to marry, and if Yang Guo does not want to marry Xiaolongnü I would highly recommend that he choose not to marry her, I am just pointing out that he is framing it as something which is beyond his control rather than a choice he is making). 3. Demand: Xiaolongnü is demanding Yang Guo to stop calling her ‘auntie’ (she demands this repeatedly, I just cut out the earlier part of this dialogue where she makes this demand again and again). In the end, Xiaolongnü also demands Yang Guo to never see her again. 4. “Deserve”-oriented language: I’m not sure this is present in this dialogue. At most, Yang Guo’s claim that he is not worthy of being Xiaolongnü’s husband is ‘deserve’ language in the sense that he claims that he does not deserve a wife like Xiaolongnü (though I translated the word 配 as ‘be worthy’, an alternative translation is ‘deserve’). 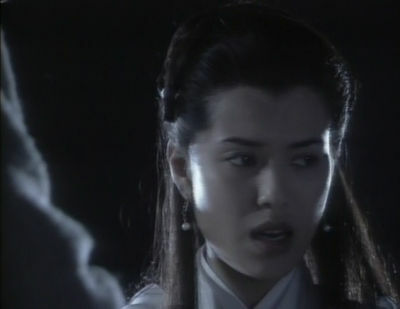 The scene where Xiaolongnü threatens to kill Yang Guo with her sword, as shown in the 1995 TV adaptation. The workbook suggests taking this a step further and guessing what the speakers’ unmet need are. Here are my guesses (of course I am using the context in the story, not just this specific slice of dialogue, to make my guesses). Yang Guo: What have I done which has hindered you? Who have I harmed? Auntie taught me marital arts, but I want her to be my wife. If you cut me with a thousand knives, ten thousand knives, I will still want her to be my wife. Guo Jing: Beast, you dare say something so disrespectful? Yang Guo: Auntie loves me with all of her heart, and I feel the same way towards her. Uncle Guo, if you want to kill me, just do it, I will never change my mind. Guo Jing: I consider you to be just like a son, I will never let you do wrong without repentance. Yang Guo: I am not wrong! I haven’t done anything bad! I haven’t harmed anybody! Guo Jing: My heart is in pain, do you understand? I would rather have you die than have you do anything bad, do you understand? Yang Guo: I know that I have done no wrong, if you don’t believe that then kill me. Guo Jing: [almost kills Yang Guo, then pulls back at the last moment, sparing Yang Guo] Reflect carefully on this. 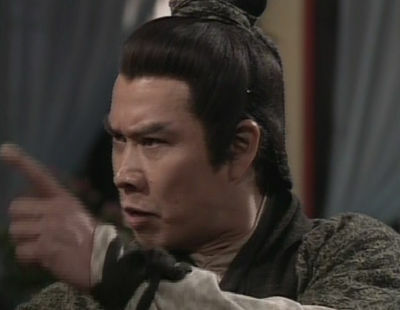 Guo Jing yells at Yang Guo in the 1995 TV adaptation. One can see how the actors performed this scene in the 2006 TV adaptation here, the 1983 TV adaptation here, and the English dub of the anime adaptation here. Hmmm, I wonder if there is any ‘life-alienating communication’ in that dialogue? 1. Diagnosis, judgement, analysis, criticism, comparison: Guo Jing diagnoses Yang Guo as being a ‘beast’ and criticizes him for being ‘disrespectful’. He is also makes a moralistic judgement of Yang Guo wanting to marry Xiaolongnü. Yang Guo also says that he is ‘not wrong’ (it mirrors Guo Jing’s language, and is also a measurement/classification of degree of wrongness). 2. Denial of responsibility: I don’t think either of them are denying responsibility for anything in this specific dialogue. 3. Demand: Guo Jing is demanding Yang Guo to stop saying he wants to marry Xiaolongnü, or as Guo Jing phrases it, to never do anything which is ‘wrong’. He also demands that Yang Guo reflect carefully on. Does Yang Guo saying ‘if you don’t believe that then kill me’ count as a demand? I’m not sure, but my inclination is to say that it is not a demand. 4. 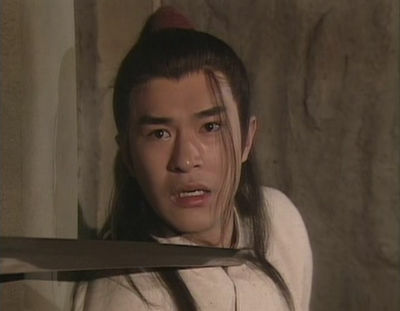 “Deserve”-oriented language: Though ‘deserve’ language does not directly appear, Guo Jing is obviously threatening to punish Yang Guo with death if Yang Guo does not submit to Guo Jing’s demands, which may be a way of communicating that Yang Guo would ‘deserve’ death if he chooses to marry Xiaolongnü. Guo Jing: Hoo boy. Where to begin? I remember the first time I read the novel, I thought that Guo Jing’s actions in this particular scene were SO WRONG. And when I look at it through the lens of measuring degrees of wrongness, it still reads as ‘SO WRONG’ to me. Trying to think about this scene from a totally non-judgemental point of view, without measuring rightness or wrongness, feels weird. I’ve also done this exercise with a YouTube video where people were engaged in a dialogue that was not going well (but I’m not going to write in detail about that on this blog because, unlike these fictional characters, the people in that video are real), and it also felt very weird to watch that video from a non-judgemental perspective. I am becoming more aware of how much of my interpretation of the world is based on measuring the level of ‘wrongness’ in others and myself. I am not going to completely forswear that way of understanding the world – at times, it might be the most useful approach – but if I am going to use the lens of measuring degrees of wrongness, I want to do it on purpose, not out of habit. I am hoping that going through the Nonviolent Communication Workbook will help me learn how put NVC into practice so that I will have the choice of using NVC. Like a Post? Why Not Subscribe!